"Advisors see the opportunities ahead of them – whether the transfer of wealth from one generation to the next, the emergence of Generation Now investors, or the shifting investment priorities of retired clients"
SAN FRANCISCO--(BUSINESS WIRE)--Today Charles Schwab announced the launch of Institutional Intelligent Portfolios™ -- an automated investment management platform designed specifically for RIAs and sponsored by Schwab Wealth Investment Advisory, Inc. Institutional Intelligent Portfolios enables firms to reach new market segments and scale their businesses, while complementing the invaluable wealth management services and client experience advisors already provide today. 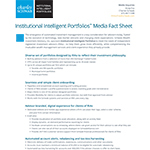 Institutional Intelligent Portfolios offers RIA firms flexibility across portfolio construction, ETF selection, and branding for their client experience. Firms can create their own set of portfolios, reflecting their investment philosophy and choosing from more than 450 ETFs across 28 asset classes and all major fund families at their discretion. Those ETFs represent more than 80 percent of the total ETF assets currently held by advisors’ clients at Schwab, and cover nearly 100 percent of advisors’ clients’ assets invested in ETFs selected for the 28 asset classes represented in Institutional Intelligent Portfolios. With Institutional Intelligent Portfolios, advisors can customize the platform to meet their business needs by determining their portfolio strategies and account features, setting each portfolio’s asset allocation and selecting their ETFs. They can also brand the client experience with their firm’s logo and contact information. Upon completion of an initial Investor Profile Questionnaire – a series of questions about the investor’s investing goals and risk tolerance – the advisor’s client is mapped to one of the advisor-designed portfolios. Advisors then make a final review of the client’s profile and portfolio assignment and adjust it if necessary before approving it, at which time money can be invested. All portfolios must maintain a minimum allocation of 4 percent in cash. Once established, these accounts can be automatically enrolled, with the advisor’s client’s agreement, for electronic delivery of trade confirmations, statements, communications and other documents, and advisors’ clients can access their account using Schwab Alliance or through a dedicated website and mobile app. Institutional Intelligent Portfolios accounts will be displayed in Schwab Advisor Center (Schwab’s desktop client management system for RIAs), alongside the advisor’s other client accounts. Data on Institutional Intelligent Portfolios accounts will be available for download through Schwab Data Delivery to use in advisors’ portfolio management systems, including those offered through Schwab Performance Technologies such as PortfolioCenter, Schwab’s portfolio management tool for advisors. Users of Schwab OpenView Gateway also will be able to access real-time information on these accounts through all participating third-party applications. The program’s pricing structure is based on total assets custodied with Schwab outside of the Institutional Intelligent Portfolios program. For advisors with less than $100 million in assets under management (AUM) with Schwab, there will be a 10 basis point platform fee. For those firms who maintain more than $100 million in AUM at Schwab, there will be no fee. No account service fees, trading commissions or custody fees will be charged to advisors’ clients by Schwab. Schwab will also provide extensive resources and support to RIAs to help them evaluate and set up Institutional Intelligent Portfolios for their firms. A dedicated, specialized advisor service team will support technical and platform functionality. For clients of advisors, Institutional Intelligent Portfolios offers 24/7 customer service when the advisor is unavailable. Schwab affiliates earn revenue from the underlying assets in Institutional Intelligent Portfolios accounts. This revenue comes from managing Schwab ETFs™ and providing services relating to certain third party ETFs that can be selected for the portfolio, and from the cash feature on the accounts. Revenue may also be received from the market centers where ETF trade orders are routed for execution. Cash Balances are held in the Sweep Program at Schwab Bank and are eligible for FDIC insurance up to allowable limits. The emergence of automated investment management is a key consideration for advisors today, fueled by the evolution in technology, new market entrants and changing client expectations. Schwab Wealth Investment Advisory, Inc. sponsors Institutional Intelligent Portfolios to meet the needs of independent registered investment advisors (RIAs) - to help them grow more efficiently, while complementing the invaluable wealth management services and client experience they already provide. Schwab affiliates do earn revenue from the underlying assets in Institutional Intelligent Portfolios™ accounts. This revenue comes from managing Schwab ETFs™ and providing services relating to certain third-party ETFs that can be selected for the portfolio, and from the cash feature on the accounts. Revenue may also be received from the market centers where ETF trade orders are routed for execution. must be enrolled to receive this service. Schwab financial professionals are employees of Charles Schwab & Co., Inc.
Institutional Intelligent Portfolios is made available through independent investment advisors and is sponsored by Schwab Wealth Investment Advisory, Inc.(“SWIA”), a Registered Investment Advisor. SWIA is an affiliate of Charles Schwab & Co., Inc. (“CS&Co.”) and a subsidiary of The Charles Schwab Corporation. Charles Schwab & Co., Inc. and Charles Schwab Bank are separate but affiliated companies and subsidiaries of The Charles Schwab Corporation. Brokerage products, including the Schwab One® brokerage account, are offered by Charles Schwab & Co., Inc., Member SIPC. Deposit and lending products are offered by Charles Schwab Bank, Member FDIC and an Equal Housing Lender. Schwab Advisor Services™ serves independent Investment Advisors and includes the custody, trading and support services of Charles Schwab& Co., Inc., Member SIPC. Independent investment advisors and Schwab are independent of each other and are not affiliated with, sponsored by, endorsed by, or supervised by each other. ©2015 Schwab Wealth Investment Advisory, Inc. All rights reserved.